Aloe Vera (Sanskrit name Kumari meaning The Eternal Young One) has been used in India for thousands of years. Ayurvedic texts have commented extensively on the benefits of Aloe Vera to the skin as Nature's own moisturizer. 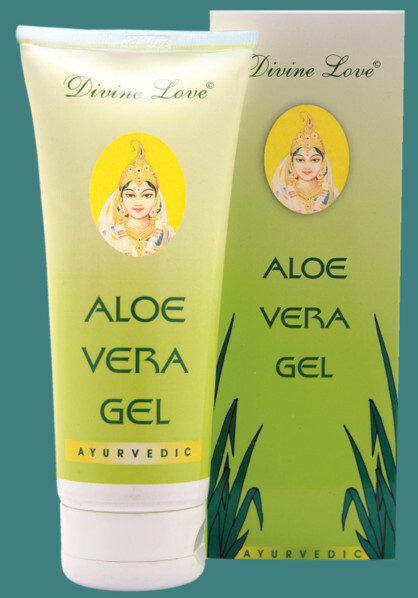 Divine Love® Herbal Ayurvedic Aloe Vera Gel is 97% pure. This natural oil-free moisturizer easily absorbs into skin leaving it soft and refreshingly toned. It is excellent for smoothness of skin viz. stretch marks, wrinkles etc. and is used extensively for sunburn and atmospheric dryness of the skin for its pleasant feel. Divine Love® Herbal Ayurvedic Aloe Vera Gel can be used frequently day or night.